Back row: David Robson. Richard Lee, Tom Hudson,( in rear) John Morrison, Mark Jones, Chris Martin. 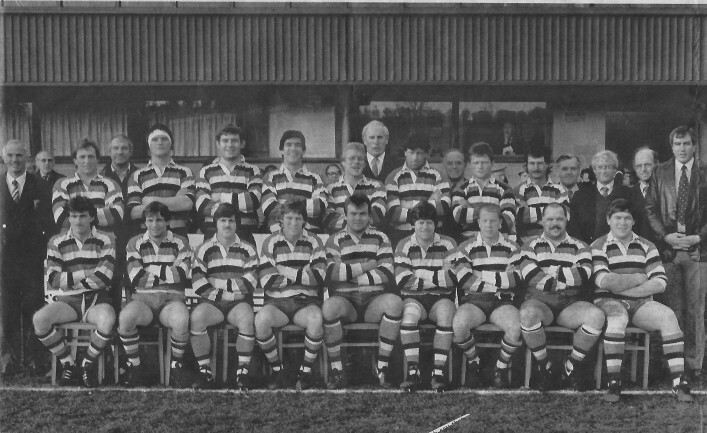 Roger Spurrell, Jack Rowell (in rear) Nick Maslen, Roger Berry,(in rear) Graham Dawe, Andy Janes, John Roberts, (in rear) Dave Parsons, Clive Howard, Brian Jenkins. Front row: Barry Trevaskis, Tony Swift, Stuart Barnes, John Palmer, Jon Hall, Simon Halliday, Richard Hill, Gareth Chillcott, Paul Simpson.